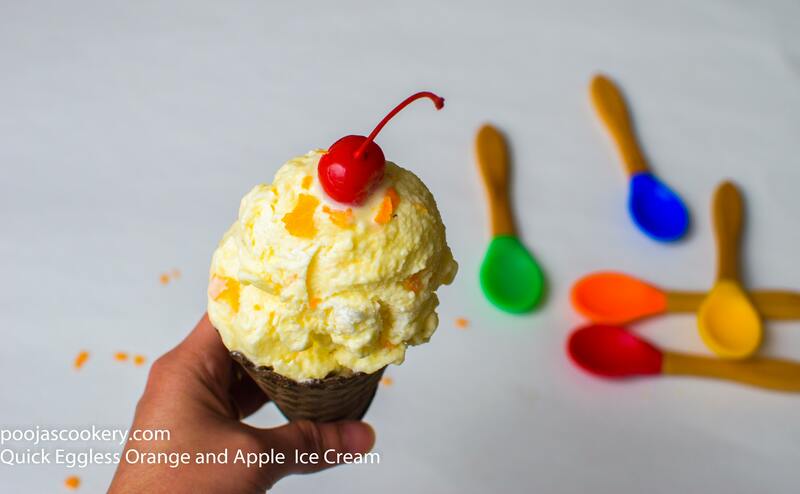 Homemade Quick Eggless Ice Cream using apples and oranges will be one of your favorite ice creams, and can be easily done. Icecream is one dessert which is loved by all, from a six years old kid to an 80 years old adult. In olden days, to prepare ice creams, we had to rely on ice cream maker , churning etc. But nowadays it can be prepared easily at home without any churning or any extra equipments. And what if you can prepare eggless homemade ice cream using different ice cream flavours ? Isn’t it great to try out the ice crème using some fresh available fruits , instead of buying store bought ones ? Though I have prepared this ice creame using orange juice and apples, the variation can be made by replacing with other fruits like mangoes, chickoos, pineapples etc. So let’s start with this quick and simple ice cream recipe . Also , I am sure you will like my other flavors of tried and tested ice creams , mango and tender coconut . Blend together orange juice, apple cubes and condensed milk in a blender. Pour it out in a bowl , add the zest and mix. Keep aside. In a big bowl, beat heavy whipping cream and powder sugar using electric beater till stiff peaks. Pour half of the whipped cream into the blended mixture . Cut and fold using spatula. Do not mix it in a hurry . Just cut and fold. Once everything is mixed, add the remaining whipped cream into this mixture and repeat by cutting and folding. Don’t worry if it is not getting mixed completely. Once you keep it for freezing, eventually, everything will get mixed up well. Pour this ice cream mixture in a pan or a container. Cover the container with silver foil or the cover and freeze it in the freezer for 5-6 hours. Remove the ice cream out just 15 minutes before serving. Scoop it in a bowl or in a cone . Sprinkle some orange zest over it(Optional). 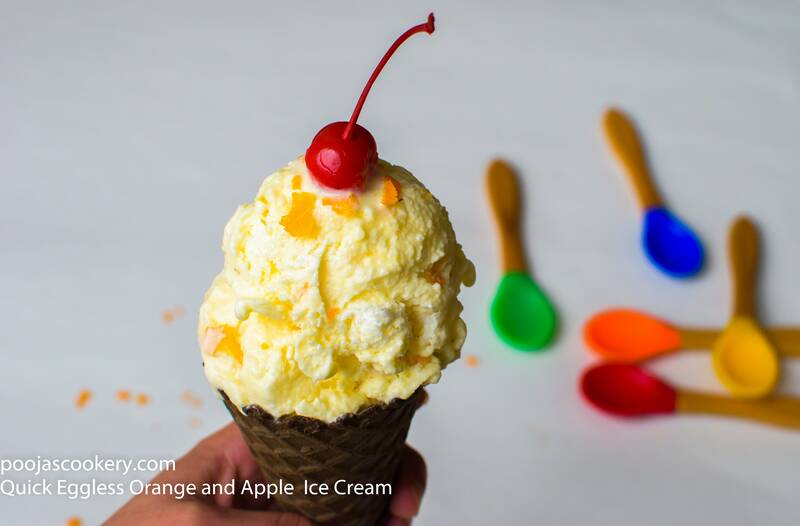 And you ready to enjoy this chilled and refreshing orange apple ice cream. Once everything is mixed, add the remaining whipped cream into this mixture and repeat by cutting and folding. Don't worry if it is not getting mixed completely. Once you keep it for freezing, eventually, everything will get mixed up well. If you are looking for summer recipes, just visit Easy summer chillers category right here ! !